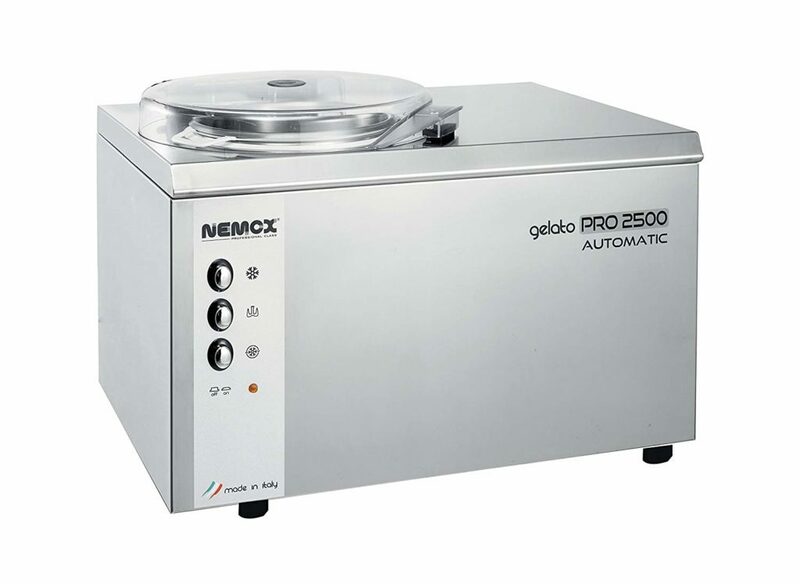 What Makes the Nemox Pro 2500 the Best Table-top Commercial Gelato Maker? What sets the Nemox Pro 2500 apart from similar gelato makers is the removable bowl. Not only does it make it easier cleanup, but it can significantly increase the amount of ice cream or gelato you’re making. Made in Italy, the Nemox Pro has been crafted by the folks that know how to make the best gelato and ice cream in the world. Other commercial-grade ice cream and gelato makers are incredibly large. The PRO 2500 easily sits on a table top. However, don’t let the size fool you, the machine is made from pro-grade parts and designed to run and run and run. The Nemox is easy to clean and easy to use. The button interface makes starting a batch a snap. The removable bowl makes it easy to clean. The Nemox PRO can produce an astounding 3 quarts an hour. Production time for a single batch is only 20 to 30 minutes. The PRO 2500 has a special conservation mode which lets you keep the finished gelato or ice cream in the machine and it will keep it cold for you if you need to leave it for a few hours which is great for a commercial machine. Where to Get the Best Commercial Ice Cream and Gelato Maker? A great place to get the Nemox PRO 2500 is on Amazon because you get free shipping as well as Amazon’s A to Z guarantee if there are problems.